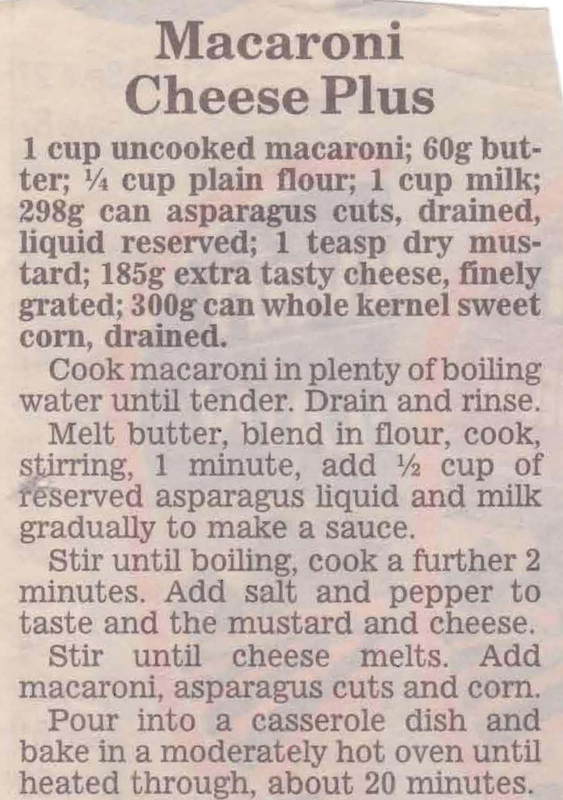 If you’re a bit tired of the usual macaroni cheese, you might want to try this old 1970s version which adds sweet corn and asparagus. I love it when asparagus comes back into season each Spring and enjoy eating it as a vegetable, in salads and in stir fries, but I think served like this it would make a terrific first course. 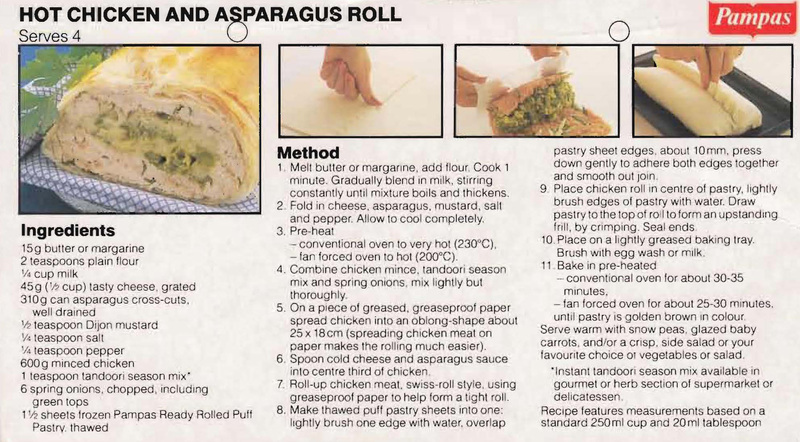 Mum and Dad both loved asparagus so I can see why Mum cut this recipe from the Herald Sun. The leek version sound good as well. Neither of Mum or Dad were wine drinkers though and I doubt they’d ever head of the matched Chateau Tahbilk Marsanne wine. I guess if you could get a bottle of the 1999 vintage for $13 now you’d be doing very well. 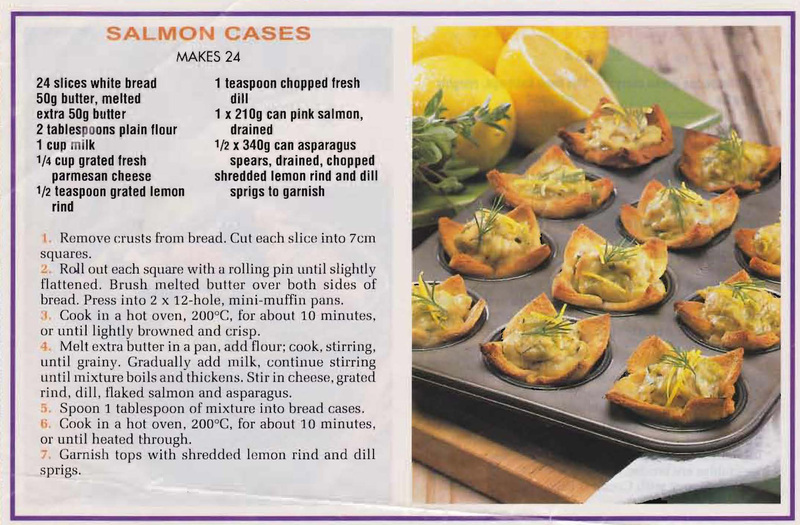 I’ve just found this wonderful leaflet entitled “Fillings for Take-Home Pastry Shells” 8 Tested Recipes from Betty King. I think it’s probably from the the late 1950s, it’s definitely from before metrics started in 1966. On checking I’ve found out that unlike Margaret Fulton, the 1970s cooking queen, Betty King did not exist. She was just an entity created as a marketing tool….an attempt to fool all of the people all of the time….so nothing’s changed there. But tastes have changed since then so I’m not sure you’d want to actually make any of the fillings. Today these filled bread cases would be great to serve up as finger food with drinks, but Mum would have made them as a supper snack. They demonstrate the way entertaining changed over the years. Mum and Dad would rarely have people over for a sit down dinner. Most people ate quite early, so friends were invited after dinner for drinks or maybe cards and Mum would serve up a hearty supper. By the 1990s things were changing for my generation, but it was still popular for Mum and Dad to entertain that way. This recipe comes from the back of the Pampas Ready Rolled Puff Pastry pack. Originally Mum had to hand make any pastry she used, so the advent of prepared pastry was almost as good as sliced bread. The first type of prepared pastry came in a block and still needed rolling out which was a bit of a chore, then someone had the great idea of ready rolled sheets and using pastry became a lot easier.